One Pierce County event in particular continues to lead the way in better serving veterans with the resources they have earned and deserve. The 7th Annual Tacoma Dome Veteran Resources Fair and Stand Down will take place Saturday, April 20, inside the Tacoma Dome Exhibition Hall. The Tacoma Dome Veteran Resource Fair and Stand Down is hosted by Nine9Line Veterans Services and co-sponsored by the Washington State Department of Veterans Affairs, the Pierce County Veterans Bureau, U.S. Department of Veterans Affairs, American Red Cross, Tacoma Public Utilities, Humana and Gene Juarez. "This event serves as a one-stop shop for everything a military veteran, family member, active-duty or National Guardsman could need," said the event director, Shawn Durnen. "The goal is to continuously address ever-changing needs and trends and to make sure the fair evolves yearly with community feedback. The event is open to all active-duty, National Guardsmen, reservists, veterans and their family members. Some of the available resources at the event will be community services, VA Benefits and VA Claims assistance, legal and homeless services, educational benefits, medical screenings, employment opportunities, financial education and assistance, justice system-related reintegration services, surviving spouse benefits and more. This event continues to expand its services reach with newer services added to this year's event such as a mobile shower unit, a T-Mobile telecommunications center, full coffee services provided by Starbucks, 30 new vendors offering employment services, and a selection of new services tailored to the LGBTQ veteran community. "This event takes around a year of hard work and planning, overseen by Nine9Line Veteran Services and a committee of service providers from Pierce, King and Thurston counties," added Durnen. Since the beginning, the Tacoma Dome Veteran Resources Fair and Stand Down has served more than 2,300 military families. "The planning efforts take nothing short of a village to accomplish, utilizing a ‘Labor of Love' to reach and support the military communities of Washington state and some other areas of Oregon," said Durnen. 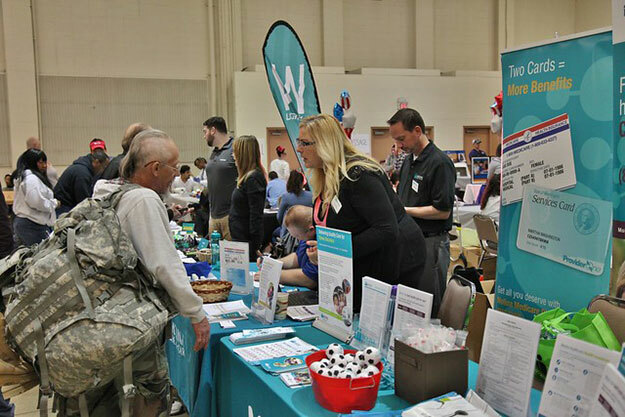 "The amazing amount of community support makes this the largest veteran resource fair and stand down event west of the Mississippi, courtesy of the Washington State Governors Veteran Affairs Advisory Committee (VAAC)." The Tacoma Dome Veterans Resources Fair and Stand Down grows year after year, expanding its reach to many rural areas of Washington state, even touching on behavioral health needs to legal assistance, complimentary dental work, increased morale and growing community support. "The continuity of this event is based on the need of hundreds of thousands of veterans who call Washington state home and who just need a hand up," said Durnen. "If nothing else, we hope that the fair will better inform our military audience that they are not alone, and as long as we're around, you never will be!" To learn more about this event, contact Shawn Durnen at Shawn@nine9line.org or by calling 253.576.2146.